If you’re looking for a lovely free campground while you’re exploring the O’Keeffe country of New Mexico, here’s a great option for you! I was planning to be away to Colorado by this time, but ended up waiting a week for a mechanic in Española to get a new steering gear box for me. That meant a week of bumming around northern New Mexico — not an unwelcome task! One of the areas of this state that I really love is the red rock country around Abiquiu. It’s a region made famous by the painter Georgia O’Keeffe, who fell in love with the dramatic scenery here and made it the subject of many of her works. Whether you’re an art enthusiast or not, it’s a great area for hiking, exploring, and just sitting admiring the vistas. 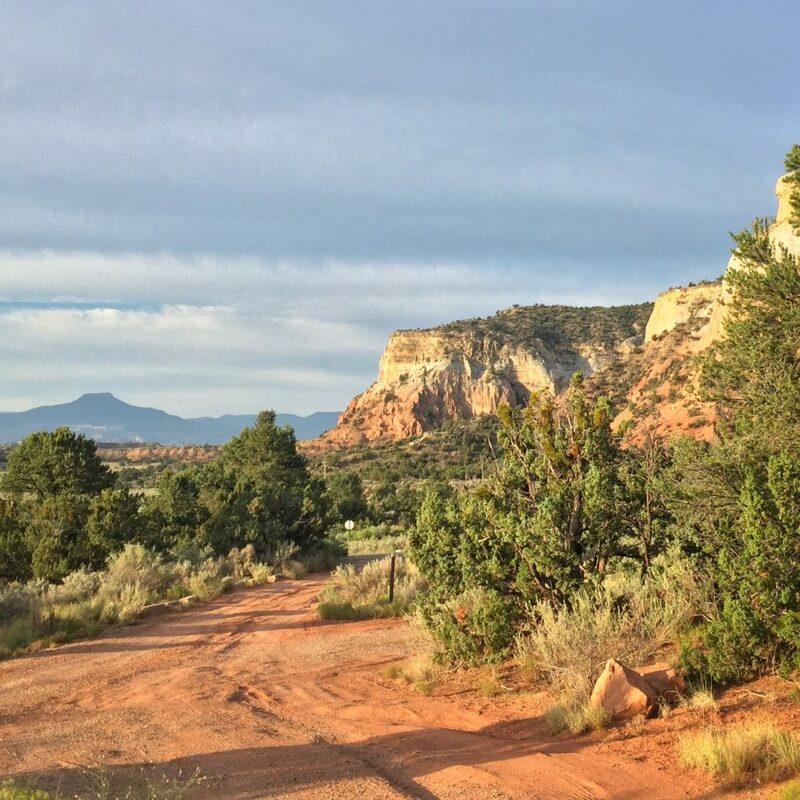 A couple of stunning nearby hikes at Ghost Ranch are Chimney Rock and Kitchen Mesa. Both of those will give you exceptional views of the rock formations that make this area so memorable. Echo Amphitheater is a natural bowl in the rocks that really does echo. If you stop by here, it’s worth making the short walk up to the “amphitheater”, and hearing what your voice sounds like when it reverberates over and over. When you camp here, you’re likely to hear other people shouting into the rocks during the day, but it’s super quiet at night once the day trippers leave. This small campground has 9 sites around a dirt road loop which was no trouble for Zennie. The sites are far enough apart that you feel like you’ve got privacy and space. All sites have a picnic table and grill, and some of the sites have pull-throughs. There are no hookups. There aren’t any shade structures at the campsites, but there are shaded tables in the picnic area. I spent a couple of nights here. One night I was the only camper, and the other night one other site was taken. The bathrooms were broken, but the doors weren’t locked, so it’s probably a temporary outage. There was water available from hand pumps, and I even had T-Mobile cell service. Official campground. Easy dirt road loops through the campground. Campsites have picnic tables and grills. No shade, no hookups. Drinking water available from pumps. Bathrooms were out of order when I was there. 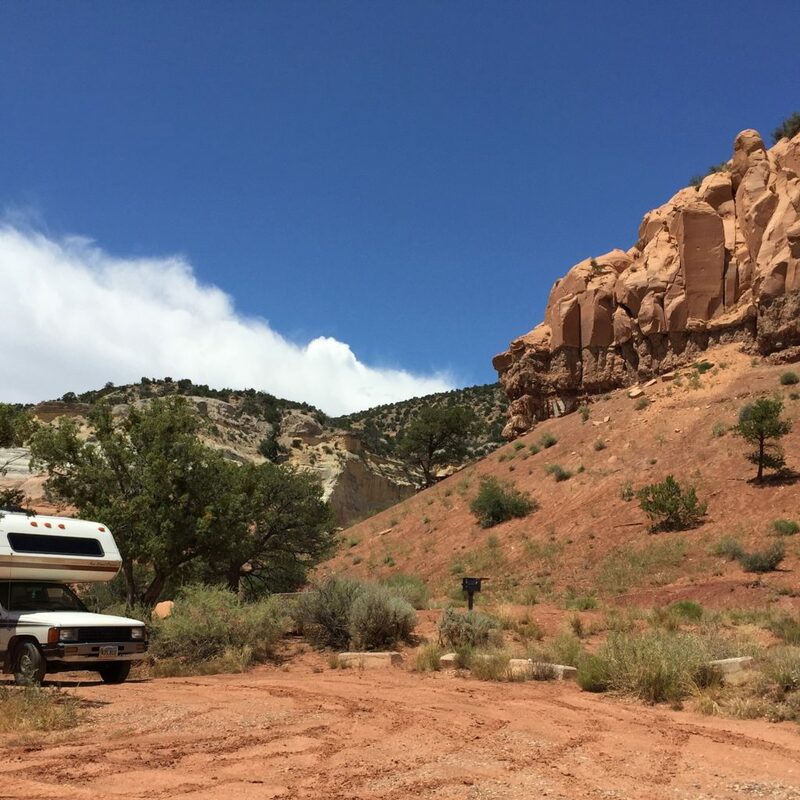 Have you camped around Abiquiu, either here or elsewhere? I’d love to hear about your experiences, so please share in the Reply section below. Thanks! Rio Grande del Norte (Wild Rivers) — Awesome camping! Hi! I'm Deanna, creator of Uphill Zen. I'm currently yondering around North America with my 1986 Toyota motorhome, Zennie. What makes my heart sing is travel, adventure, and the awe-inspiring wonders of nature. Finding ways to share that joyous spirit is what this is all about. I am looking forward to spending some time in Northern New Mexico in July. Although it is primarily work related, I want to take advantage of the natural beauty and culture of the lands. I will be around Ojos Caliente. I hope to take lots of good photos and write a lot as well. Northern NM is gorgeous! I really love it up there. You’ll find plenty of natural beauty, outdoor opportunities, and history and art, too. And of course some excellent NM food, too. Thanks for your comment, and have fun!! – Deanna. Thanks for sharing! Comments are held for moderation, and manually approved before they appear. I try to answer all of them, but I'm often off grid, so it may take awhile!